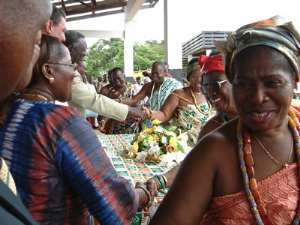 Dodowa, Dec. 1- The Greater Accra Regional House of Chiefs, has retained Kpone Mantse (Chief of Kpone), Nii Tetteh Otu as the President of the House, whilst Prampram Mantse, Nene Tetteh Djan, was elected as Vice-President. The President, the Vice-President and three other chiefs namely: Nene Abram Kabu Akuaku III, Ada Mantse, Nii Adote Obour II, Sempe Mantse, and Nene Klagbordjor Animley V, Osudoku Mantse were elected unopposed to represent the House at the National House of Chiefs. They swore the oath of allegiance and the official oath before an Accra Fast Track Court Judge, Justice George Aryeetey at Dodowa, near Accra. In a speech read on his behalf, the Regional Minister, Sheik Ibrahim Cudjo Quaye, appealed to the chiefs to support the District Assemblies and all sub-district structures to attain its developmental objectives. He said chiefs could initiate poverty reduction projects and programmes like the construction of schools, provision of water and enhance revenue mobilisation and waste management in their communities. Sheik Quaye expressed concern about the rising incidence of indiscipline in society and called on the chiefs to revive their traditional moral values of respect for elders and authorities, to support the Vice President's campaign against indiscipline. He also called on them to urge the electorate to turn out massively on December 7, to exercise their franchise. Nii Tetteh thanked members for the confidence reposed in him and promised to operate an open door policy to move the development agenda of the House forward. He called for peaceful Presidential and Parliamentary elections, adding: "Ghana is our only home, let us maintain the peace that already existed so that we don't end up like those in other West African countries who are suffering as a result of wars.